The Captain's Journal » Where is the Afghan National Army? Where is the Afghan National Army? General Nicholson asks what is apparently the popular and salient question. Where is the Afghan National Army? About 650 Afghan soldiers and police officers have joined the estimated 4,000 Marines in the offensive. Nicholson said he would like to have all of his Marine battalions paired up with Afghan battalions – a process he predicted would take at least several months. Ralph Peters is asking the same question. LAST week, 4,000 US Marines launched a major operation in Helmand, the poppy- queen province in southern Afghanistan. The Marines performed magnificently, reaching their objectives with minimal casualties — mostly from the 110-degree heat. But something important was missing: Afghans in uniform. A few hundred Afghan players showed up in the backfield. But the village elders saw American guns. The Marine mission is to provide security for villagers, build trust and instill confidence in the Kabul government. This would all be far easier if the Afghan military and police were competent, trustworthy and present. After 7½ years in Afghanistan and despite extensive efforts, we and our NATO allies have produced only a now-you-see-’em-now-you-don’t Afghan army. The police are corrupt, partisan and loathed by the population. There is yet again another discussion of the same thing at the Small Wars Journal, a subject we already briefly addressed. We have seen this before in Iraq where the goal was training and turnover to the Iraqi Security Forces. Note however, that Marine operations in the Anbar Province didn’t start with ISF assistance, or even end with it. Given national patience and the fortitude to see the campaign through, there is no reason that the Marines need anyone else to perform counterinsurgency operations in Helmand – at least, not right now. It’s no different from the campaign in Anbar. Eventually the Marines will leave, just as they left Anbar. But we are at the beginning stages of true COIN operations, and The Captain’s Journal is no more surprised at the lack of functional, reliable ANA troops to accompany and be mentored by the Marines than we are dismayed by the lack of ANA support for the Marine Corps operations. Surprise and dismay at this development underscores a basic naivety concerning where we stand in Afghanistan. But the message isn’t coming through. So let’s have another round on this issue, this time in pictures. 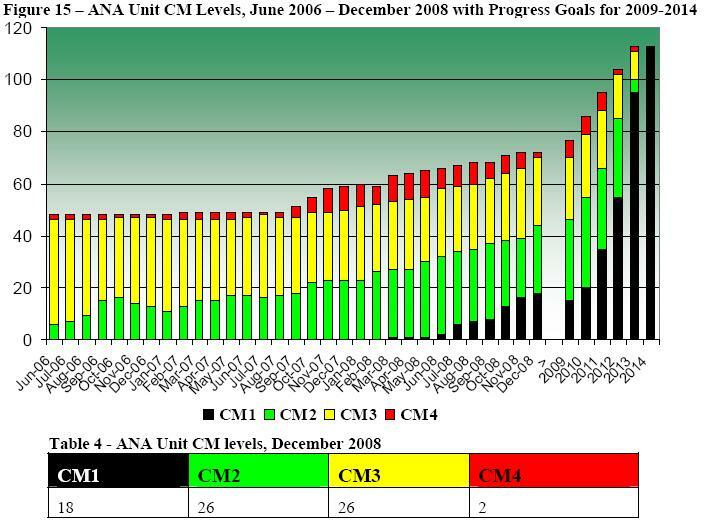 Here is the latest DoD report to Congress on Afghanistan, and a graph of ANA readiness. The following description attends the pictorial metric. As of November 2008, the ANA had seven battalions and one brigade and one corps headquarters rated at Capability Milestone (CM)1: capable of operating independently. Twenty-nine battalions/squadrons, six brigade headquarters, and three corps headquarters were reported at the CM2 level: capable of planning, executing, and sustaining counterinsurgency operations at the battalion level with international support. Twenty-five battalions/squadrons, four brigade headquarters, one corps headquarters, and the ANAAC headquarters were reported at the CM3: partially capable of conducting counterinsurgency operations at the company level with support from international forces. Six battalions/squadrons and one brigade headquarters are reported at CM4: formed but not yet capable of conducting primary operational missions. Finally, there are eighteen battalions/squadrons and two brigade headquarters that are still not formed or reporting. This particular graph of security incidents has not come out in the public domain that I can find, but it is helpful. We must see the situation as similar to the one in Iraq at its worst, and then again, the conditions are even worse than that. The country is almost non-existent, there is no sense of nationalism, and there is significant drug abuse and incompetency in the Afghan National Army. It has been estimated that if the ANA were to implement drug testing, it would lose as much as 85% of its forces. Surprise at this statistic and at the lack of ANA troops to accompany the Marines through Helmand only underscores a basic naivety concerning the situation in which we find ourselves in Afghanistan. We are starting over, and impatience with the campaign will only bring frustration to ourselves and the Afghanis. This will be the longest campaign of the long war. Considering your point about the lack of national identity, is there any value in considering whether Afghanistan should be broken up along tribal/ethinic lines similar to Yugoslavia and Czechoslovakia? Or perhaps a much looser, confederation of tribal provinces with minimal national government? Good comment. I fear that such a solution would be even worse. The Pashtun areas might still be willing participants in protection and haven for globalist elements, while the North still wouldn’t be, and civil war would be ongoing like before 9/11. We would have to consult an Afghanistan expert, and I am certainly not one. Adjusting national boundaries is a slippery slope that would seem more likely to stimulate long term unrest throughout the region. The deeper issues will always tend to point back to Axial Age (900 to 200 b.c.e.) religious and spiritual transitions within the populations throughout the Muslim regions towards a globalization of the Golden Rule, in short, religious reformation for Muslims themselves to reject fundamentalism. Power and military force nearly always proves to be a necessary partner to help set the scene for religious enlightenment. So we must not lose track of the importance of the other partner element of the equation, i.e. religious reformation. We need to development and enable strategies for the internal voices of reform to be heard where it matters most. Let’s consider a new passive “communication dimension” of foreign policy initiative that initially seems to serve most free-world interests: task military grade communication and observation satellites and drone platforms to enable “public and/or media access” to observe events and or “report out” information in sealed off societies that refuse to allow the media to do their free market reporting of observations. While this might prove embarrassing from time-to-time it would only apply to countries that restrict or prohibit the free market media from doing their job. Rules of engagement would obviously need to be carefully thought through. Free the media or we will enable your actions to speak for themselves to the world. There is nothing more compelling to change tyrants than 4 or 5-billion wittinesses. Would this serve only the agents of change and not the agents of freedom and liberty? Yes it could be used against or for, our goals. There would be no guarantee it would work for our national interests at all times. On the other hand, it’s not as though we concede any heretofore unknown spy technologies, and with low level drones flying above 55,000 feet, we have a virtual bird’s eye view of every bloody nose, license plate, and untied shoelace. At least engage the idea and give it a trial run. Assuming we deployed such tactics along with the willing allies in the region against say, Iran for example, would US interests be any worse off? I, for one, am ready to sign up for Warbucks’ idea of feeding in real news to countries that lack a free and independent media, so long as the U.S. is FIRST IN LINE. When you have the overwhelming majority of media in the U.S. controlled by and dictated to by the White House and majority party, there is a genuine lack of information getting out to the U.S. public. Yes, just imagine, news flow without editorial control or political spin. It could be a spiritual experience. Haven’t we had something like that in Voice of America? And hasn’t every administration since de-funded it? Does it even exist any longer? Yes, voice of America allows information in, the new effort would be to modify observation and communication platforms to allow “civil band width” communications by the sealed-off public within the society to send real time media, phone, picture, email, information out of sealed off countries. The platforms would also send what was otherwise “military grade observations” on the multi-media feeds for the world to see. Media, Bloggs such as yours, could sift through hot spots and present near live coverage and live coverage, to the public on protests, crackdowns, and suppression. The idea is, and there is some margin of error here, but the idea is that on average, US and willing Allies could pick and choose which countries to cover based on how sealed off the country becomes. No doubt North Korea would proclaim it an act of War, i.e., showing the reality of living conditions. But there are levels of threat that are worth accepting. Consider Iran; Both Bush and Obama Administrations claim they are funding arms, training, soldiers and terrorists, and explosives into our Iraq and Afghanistan. They are already at war with us. The risk vs reward on Iran would probably be to provide coverage for the youth movement in Iran to continue to send out unhampered, live coverage of their protests over these military supplied communication platforms. If the youth movement protest can be helped in a passive observational way, we should put together a plan to do it and give it a trial run. Directly assisting the millions of ordinary people in Iran who are fighting and dying for real freedom…. what a concept! Wake me up when this bad dream is over, please. There is more than one passive way (I hear) to enable signal-boosting from cell phones and/or increase sensitivity of signal receivers and transmitters. Usually key cities are near large bodies of water (seas) which provide less intrusive observation posts as opposed to fly-overs. There is another point which renders this a doubled edged sword more inclined to serve the interests of basic human rights over the interests of any governments. We assume US interests can tolerate transparency and the free flow of information. Once this creature is set free, it will not go back into its box lightly. What if the US elects not to deploy the system for the infamous First Amendment trump card, “National Security?” How many ways would our enemies use that against us? Ultimately it would seem to be human rights that would have the most to gain from its use. While we would all agree we think we are “for human rights,” those human rights may not be rights we want pushed into our faces and help up in front of us. It does not take too much imagination to see how this could be used against our own sensitivities from time to time. On balance, it would be a powerful moral compass of truth for a world of lies, egos, war-Gods, and hidden agendas. Perhaps a good name of it would be, The Humbler Project, where truth has a way of letting us all look into the mirror, whether we want to or not. But you missed the point that TSAlfabet so sardonically posed. The administration “righteously” refuses to meddle in the case of Iran, but then tries to bully Israel into accepting Obama’s plans and tries to threaten Honduras into accepting the puppet of Hugo Chavez. It’s the duplicity that TSAlfabet doesn’t like. And for reasons of duplicity, he suggests that your plan won’t work. After all, an administration must be willing to press democracy programs in Iran in order to have any leverage. And beyond the duplicity factor, Captain, I maintain that Warbuck’s idea of supplying information to these countries presupposes that there is actually some sort of plan or strategy or even desire to see any totalitarian state weakened, let alone toppled. Sadly, the U.S. policy seems to favor leftist dictators while spitting in the face of the remaining democratic allies we have left. 2010 elections can’t come fast enough. Yes Captain I agree with both points made by TS and your point as well concerning the inconsistencies of US foreign policy. I just did not see the Israeli discussion point made by TS (even as I agree with his fine point) as an example of the free press prevented from access to do their job or a mass shut down of in-country multi-media outlets. While I tend to be very conservative in my personal politics, generally I refrain from offering critiques other than to offer alternative ideas that might find their way into policy to help. I leave it to you pro’s and experienced policy experts to critique. My thing is to focus on alternatives that maybe haven’t been tried. I post on your blog because I suspect the high caliber talents that follow you do so perhaps stealthily so as not to empower you. It’s as close as I would ever get to warriors that render real policy influences. If they happen to trip across one of my out-of-the-box ideas after a few martini’s, I might start looking better to them around closing time… and they might take it home with him and wake up with it the next morning and take it to work…. much like an infection. You are currently reading "Where is the Afghan National Army? ", entry #3338 on The Captain's Journal. This article is filed under the category(s) Afghan National Army,Afghanistan,The Long War and was published July 9th, 2009 by Herschel Smith.